Madder Owain was a perfectly normal, mild-mannered Fed-Ex employee – until he tried to sort out a damaged and mis-addressed package and inadvertently became the host for one of Demon’s experimental supernatural weapons – a vaporous liquid mist of darkness which has infused his body and which he’s since dubbed “The Dark Imbuement”. While he was as yet unaware of his new powers, he received something of a crash course in their nature when Yukikaze (“Snow Wind”, a mystic ninja) – was blasted through the wall of the Fed-Ex building and landed at his feet, hotly pursued by the Three Storms of the Underworld. He’d been rather wishing that he could disappear rather than having to deal with any more nonsense that day – and promptly fell into a role as a spinner of minor illusions who could. That fooled the Three Storms for long enough for Yukikaze to transport them both to Annwn, the Celtic Twilight Realm. 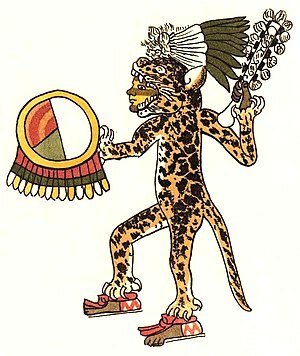 That led to a whirlwind trip through several of the magical Hundred Worlds, an encounter with Isacora (Ranko’s young were-jaguar son), the belief that he’d become a Were-Jaguar (which the Dark Imbuement promptly made “real”), an extended training session with the Jaguar-Warrior minions of Isacora’s father Huitzilopochtli (which resulted in a portion of the as-yet unfocused power of the Dark Imbuement giving Owain some permanent cat-powers), some dealings with Gingitsune Makaze – the only truly powerful sorcerer Yukikaze knew of in Japan – and his adoption of a daughter to transfer the (presumed) were-jaguar spirit into (an action which – with his newly-strengthened dark impulses – seemed reasonable to him at the time). In fact, Gingitsune – a mercenary at best – recognized that Owain had not, in fact, truly become a were-jaguar – but was more than willing to bind a child-offering to Isacora; it wouldn’t hurt the kid – in fact, it would give her were-jaguar powers – and it was always good to have an “in” with one of the local demigodlings! Especially when you got to charge a pair of superheroes for getting it! Owain presumed that the excitement was over – but awoke the next morning with werecheetah powers and had to save the Memphis Fed-Ex facility from minions of Demon, sent to find their terrible lost weapon! Since then, he’s been taken into the loose organization of the Mandate – and has been given a uniform and a few random gadgets, as is their usual habit. The “Dark Imbuement” is one of Demon’s (several) attempts to exploit the faerie magic which has recently been unleashed across the globe. Combining the powers of air and darkness with a bit of Demon’s usual infernal magic to let it to more easily bind to a human soul – and hopefully to place the resulting changeling-hybrid under Demon’s control – resulted in a vaporous mass of something-or-other, awaiting a human host. Further analysis of the results was put on hold. With both The Guardians and The King attacking the research outpost, the enchanted alembic containing the experiment was entrusted to a minor minion to carry to another base. Said minion did his best; when he realized that The King was on his tail, he managed to stuff the alembic into a box, address, and entrust it to Federal Express before being captured – but did not realize that the experiments unstable magic would overwhelm the containment spells and warp both them, and the addressing on the package, into a jumble of sorcerous runes. The “Dark Imbuement” is – at least at the moment – a unique creation, a power drawn from faerie and bonded with a human soul that grants its possessor a portion of the shifting, adaptive, magics of the fey, allowing the user to take on pretty much any role that he or she could dream of. While Demon had hoped for such a result – they aren’t COMPLETELY clueless – the Dark Imbuement is sadly obvious to powerful magicians, making it less-than-ideal as a means of infiltration. The Dark Imbuement might even be replicable, although it certainly wouldn’t be easy. Fortunately, it isn’t inherently evil – or at least not very evil. It bonds to the darkness in human souls, yes – but human souls mix both light and darkness, and the point of attachment is far less important than the use to which such power is put. As written, the Dark Imbuement is also a terrible piece of cheese: the user can assume roles worth a hundred and eighty points for a mere twenty-five points. On the other hand, such roles do require game master approval – and obviously have some dark sides, such as being infused with infernal and faerie magic, attracting the attention of such things, and whatever quirks and disadvantages come with a role. Given that all the characters in the campaign are allowed a couple of big slices of cheese, it’s acceptable. Characteristic Rolls: STR: 14/15-, DEX: 14/14-, CON: 13/13-, INT: 13/14-, EGO: 11/12-, PER: 15/16-. Run: 6/11″, Swim: 2″, Jump: 6/16″, Lift: 696½kg/1600kg. All abilities easily detectable by magical senses (-1/4). once in one – can easily maintain it indefinitely. approved by the game master. primary attributes does not affect secondary ones. four clips of six charges each. abilities -.5 OIF (Uniform), -1 (Conventional Technology Only). Computer: Int 13, Dex 0, Spd 1 (-27 Points Base). command systems. 2) Replay information/database search. Both programs normally run continuously after boot-up. Costs: Characteristics 99, Powers 171, Base 125, Disadvantages 175. 270 Spent, 300 Available. Appearance: Madder was middle-aged, but is slowly growing younger due to the Dark Imbuement. He now has dyed black hair. He always wears sandals, even in winter, so he doesn’t tear his shoes. He has a slender build.